PrimeDELIVERY™ allows pharmacies to offer customers the convenience of having their prescriptions delivered, while ensuring an electronic paper trail records the delivery and captures required signatures. The wireless delivery system software can be installed on any Android or IOS device and work seamlessly with PrimeRx™ and PrimePOS™. This allows pharmacies to manage prescriptions generated in PrimeRx™ for delivery and copay collection. PrimeDELIVERY is a pharmacy HIPAA-compliant in-house and wireless delivery solution. Works seamlessly with both PrimeRx™ and PrimePOS™. This allows pharmacies to quickly manage prescriptions generated in PrimeRx™ for delivery and copay collection. The patient can sign once for multiple prescriptions and has the ability to uncheck specific scripts if they do not wish to take delivery at that time. Data is encrypted and remains highly secure while in transit. A patient only has to sign once for multiple prescriptions delivered. Patients also have the option to uncheck specific scripts if they do not wish to accept delivery at that time. Delivery technician captures notes such as “No one available to accept delivery,” “Patient refused to accept delivery of Rx#1234567,” etc. Notes can be transferred to PrimeRx™ as a part of ‘Delivery Notes’. The data is encrypted and secure while in transit. Delivery technician has all the required information to make the delivery and collect the copay. HIPAA compliant – No information links the drug name with either the prescription number of patient identity. All undelivered prescriptions are reconciled. 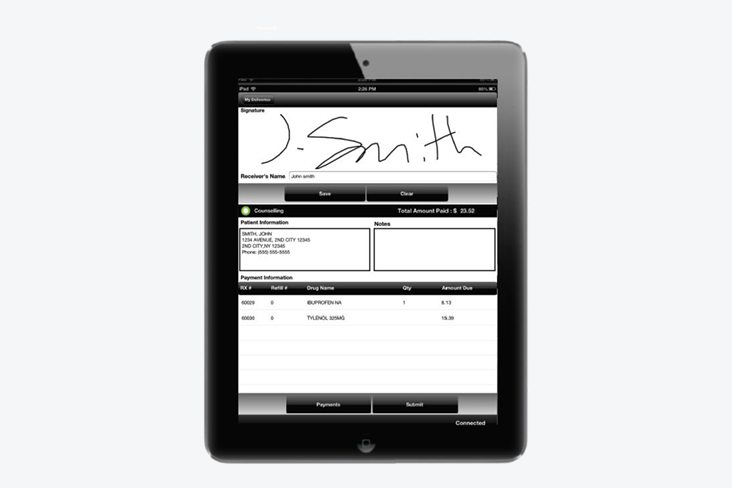 All signatures are saved electronically in the patient’s history. This can assist in verification of delivery and saves saving valuable time during an audit. Prevents loss of copay and missing prescriptions during delivery. The delivery technician simply takes the device with him/her and punches in the Rx# prescription number to pull up the record. A signature for this record can be obtained upon delivery and is then sent directly to the PrimeRx™ database and saved to the patient's history. The pharmacy gets a status of the prescription delivery in real-time. The process is simple, efficient and secure. Once the wireless network is set up, the delivery technician can log in to a separate delivery program on the desktop and access a listing of all prescriptions scheduled for delivery. This is then stored in a batch and loaded on the actual device. The delivery technician, while out for delivery, can pull up a specific prescription from the batch stored on the device, and obtain the required signature. These signatures are stored on the device and can be uploaded back in the PrimeRx™ Pharmacy Management System when the delivery technician returns to the pharmacy. This process saves additional data costs and provides an efficient delivery process. 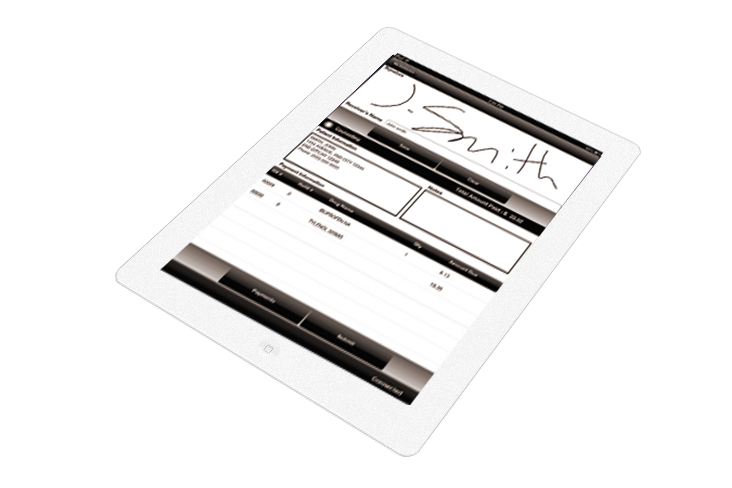 Signatures are saved with the patient record, safely and securely. PrimeDELIVERY works off the data plan on the device (3G, 4G, LTE, etc.) as well as off of WiFi. Yes. PrimeDELIVERY monitors copay collections and updates PrimePOS and PrimeRx data. Data moves from PrimeRx™ to PrimePOS to PrimeDELIVERY™ and back in a seamless and integrated manner. Yes, a single purchased license of PrimeDELIVERY software can support multiple devices operating in the same pharmacy. Aside from prescription pickup signatures, does the software also capture HIPAA Acknowledgement signatures? Yes. When the delivery person updates the system to provide delivery information, an undelivered prescription can be “unchecked.” The delivery person can also provide the reasons for the non-delivery, which is captured in the “delivery details” section of PrimeRx™ and used for second attempts at delivery.